Black beans are my favourite within the family of beans. Similarly to black sesame seeds, black beans are somewhat nutty in flavour. They make delicious and satisfying meals. Here, is a pate which can be eaten as a condiment, with bread or vegetables. 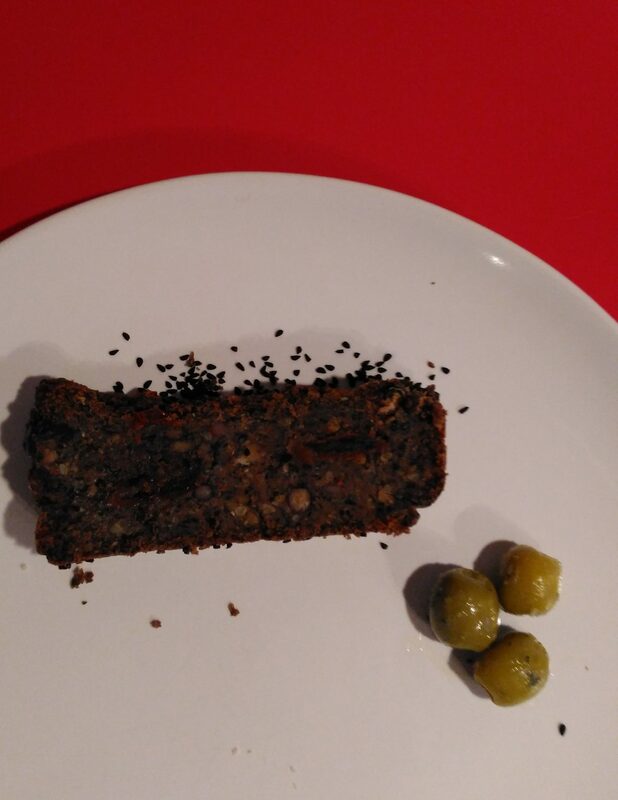 I like to eat it with olives. Bath millet in hot water and cook for 25 minutes. Stir often. Add salt at the end of cooking. Drain. Chop onion and pepper. Fry them in oil. Add tarragon, marjoram, allspice powder, and paprika powder. After 10 minutes, add the chopped garlic cloves and fry for a while. Set aside. Take a bowl. Add millet, cooked black beans (and tahini if you use it) and the contents of the frying pan. Blend everything with a blender intto a smooth pate. Line the baking tin (size 12cm x 26 cm) with a baking paper. Spread half of the pate. Put the dates closely to each other and cover it with the remaining pate. Bake for 50 minutes at 180C. Cut into pieces only when completely cooled down. If you enjoy subtle deeper taste, add tahini. Both dates and tahini contribute to making it a really delicious pate. Dates break the somewhat nutty and slightly bitter (from millet) flavour. You can also use sun-dried tomatoes (from oil) as an alternative to peppers. As you see from the photo, the pate was not blended smoothly. I like it this way, but you can blend it as smooth as you like. Now, it is only important to know how to cook black beans. Black beans should be pre-soaked (to reduce sugars which cause flatulence.) There are two simple ways to do it. After you have washed your beans, place them in a saucepan and add three cups of water per one cup of beans. Boil the beans for a couple of minutes, take the pan of the heat, cover it and allow it to stand for 2-3h. The second way I usually follow is to soak the beans in water overnight (or 8h at least). If it is relatively warm in the kitchen, keep the pan in the fridge to prevent beans from fermenting.